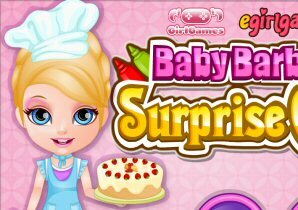 Description: Baby Barbie Cake Surprise game Baby Barbie wants to surprise her mother with a special birthday cake! Help her in the grocery store to buy the right ingredients to make her special cake! Then help her bake it! Her mom will love what you and baby Barbie have in store for her!